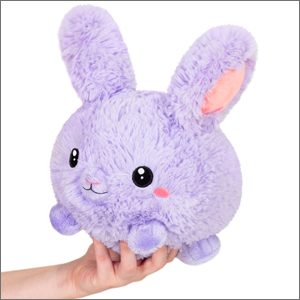 Mini Squishable Purple Fluffy Bunny: An Adorable Fuzzy Plush to Snurfle and Squeeze! Lavender flowers! Bunnies! Let's compare. Lavender flowers show up in late Spring! Bunnies are active pretty much all the time. Lavender is often used in soaps and essential oils! Bunnies are often used in cuddling and the more domesticated of nature documentaries. Lavender has a relaxing herbal aroma! Bunnies don't smell like anything much besides Bunny. It's true that their similarities are few, but that's not going to stop us from mixing them together and seeing what happens. Well what do you know! It worked! A perfect fluffy floral little bunny! In Lavender!